Twitch Plays Pokemon Crystal: Right In The Feels! After the success of Twitch Plays Pokemon – an Internet experiment where 10,000+ people play a single game together – the developer decided to continue the hit with a second season based off of a hacked version of Pokemon Crystal. Though despite lower numbers, what this season might lack in viewership it dramatically makes up for in this story. No Gods this time! There are only ‘Mon in this emotional coming-of-age tale that is sure to make anyone shed a tear. Instead of using the original Crystal version, a hacked version has been used instead. Story elements all remain the same. The only thing that changes is Pokemon availability, difficulty, and possible in game trades. For example, you can apparently trade a Common Abra for the Legendary Moltres in Goldenrod City. Also, Pokemon that evolve via trade instead evolve at a certain level like normal Pokemon – which is why the team’s Onix evolved into Steelix without needing to be traded while holding Metal Coat. One final gameplay change happened on the developer end. This time, in addition to the fan chosen dual system of Anarchy (free for all) and Democracy (vote per move), Democracy was automatically initiated at the top of each hour. Despite some of the worst mistakes being made during Anarchy in the past – releasing starter, lost in puzzles, etc – forcibly initiating Democracy mode at the wrong time is just frustrating. And here we were, voting on which button to press to simply advance the dialogue in this battle with Sabrina. I witnessed this happen multiple times and each one was during very straightforward times – like walking into a town or during the text portion of a battle. Democracy should be reserved for the harsh puzzles, such as the invisible maze in the Ecruteak City gym that teleported you back to start if you didn’t take the right step. Though despite these games having much harder puzzles than the original generation, Anarchy Mode beasted through eventually showing that Democracy might not be needed – especially if its going to be forced upon them. One thing that has definitely been more noticeable this time around with Twitch Plays Pokemon has been the presence of Trolls – people who make it their purpose to upset people and cause chaos on the Internet. Now sure, wherever you go on the Internet today there’s bound to be people like that, though this time around the spamming was SO intense. During the original Twitch Plays Pokemon, there were a lot of unfortunate moments – such as releasing our starters, tossing items, etc – but the players and fans made the best out of it. This time around there were tremendous amounts of people calling for the release of our starter Totodile. This number rose even higher after he evolved – a process that was also being purposefully prevented by people. Some even made up fake memos from the Twitch developer that threatened to cancel the stream due to Feraligatr “making the stream less fun”. Our last strong Pokemon was hailed as Bird-Jesus and no one called for his release. 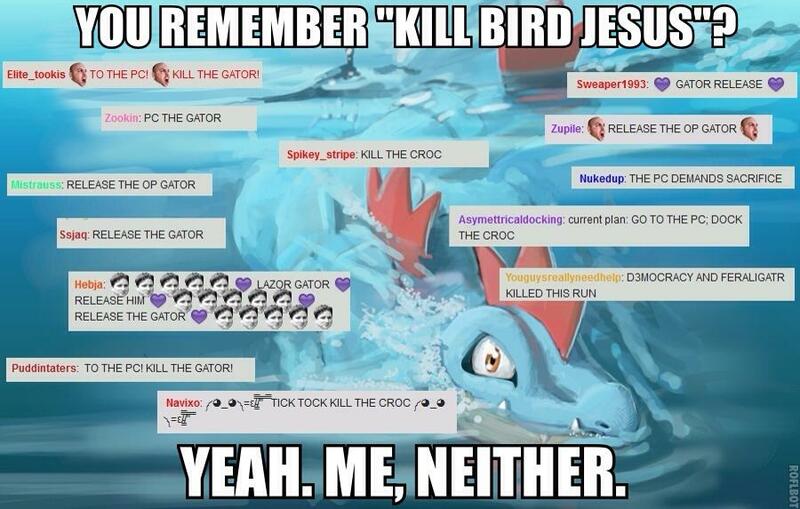 Feraligatr was not so lucky and received a lot of spammers calling for his demise. Though once again, the true Twitch fans/players worked past this with amazing teamwork and were able to defeat the Elite Four. To release our starters again, etc would be too repetitive – as if that was the Twitch thing to do. Though in reality, banding together and accomplishing your goals is the true purpose of this stream – and we did it! Despite all the trolls and people purposefully slowing us down, we completed the first leg of this journey in almost record time – compared to our first attempt with Red. We’ve learned from our mistakes the first time around and it truly shows here. As I said earlier, there were no tales of Gods or religions this time around; instead, we got an emotional coming of age story. There was loss, redemption, alliances; and it all started with a Totodile. From the moment we realized Totodile’s Leer attack looked like he was shooting laser beams from his eyes, the nickname LazerGator was born – a name that would stick with him till the end. From Totodile to Feraligatr, Lazergator rose to become our most powerful team member and defeated most gym leaders single-handedly. As our most used Pokemon, Totodile’s gained levels fast, but with all the trolling and random button enters, his evolution was always canceled. Through more and more adventures we started to amass a team of other low level/baby Pokemon – the cutest of which was Togepi – the innocent baby Pokemon who was called the Young Prince for his crown-like head. 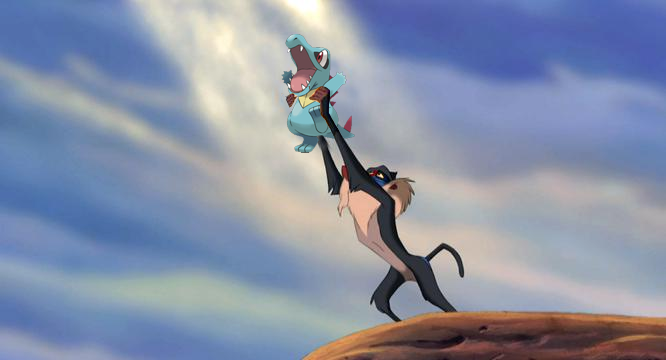 With Totodile being so far beyond everyone else in the team – and switching Pokemon being difficult to coordinate – the baby Pokemon stayed babies, but luckily that would soon change and people rallied to make sure Totodile evolved until he became Feraligatr. The Pokemon that never grew up evolved so that he could be stronger for his teammates; however, there was one fate he couldn’t protect them from. Some people became upset and felt Feraligatr was stealing the battles from other Pokemon – even though they clearly stood no chance against their superiorly leveled foes. Due to this, a witch hunt of sorts started which called for Feraligatr to be released. 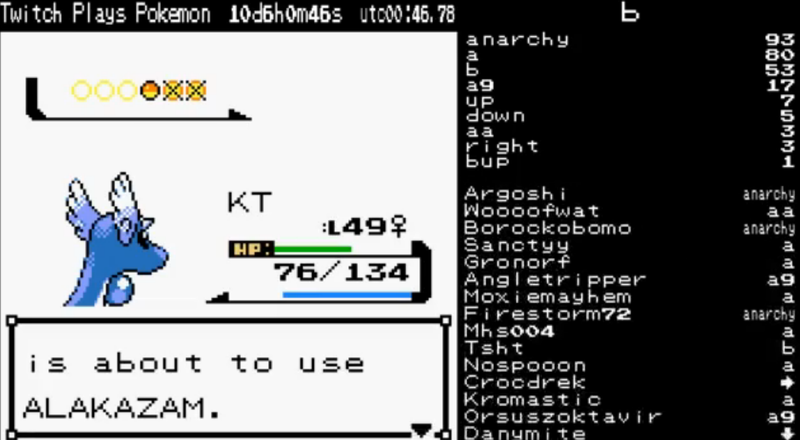 In the final moments of this, Feraligatr was spared but the innocent Togepi was released instead. Yes, thats right. The small defenseless joyful egg Pokemon was released into the cruel world. For a fan-illustrated version of this story and more, click this photo! This moment galvanized many people to push harder for moving forward rather than let others try to hold them back and release more Pokemon. 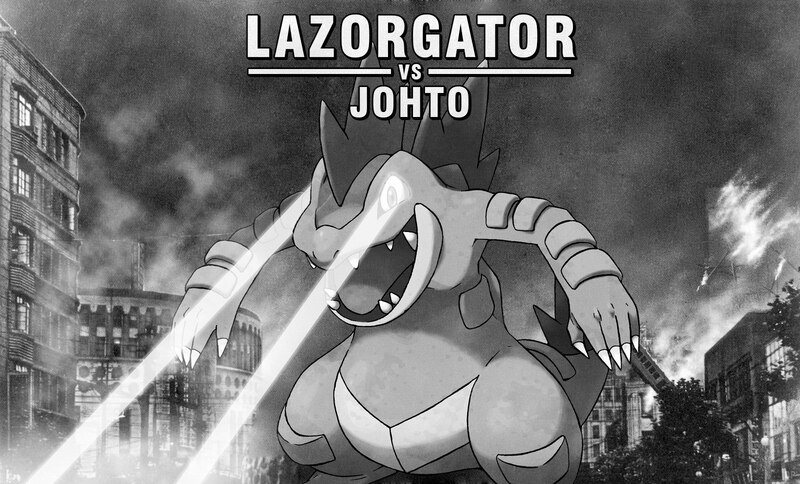 In addition to this, other Pokemon on the team began to get stronger as well – though none would come close to LazerGator. Brian the Pidgey evolved to Pidgeot and our Eevee evolved into Espeon, which considering our Twitch play though of Pokemon Red is amazing. Last time everything story wise was taken through the lens of religion and Gods, but not this time. Early on people bashed our use of Pidgeot saying he would never be as good as Bird Jesus – but we didn’t want him to be. Again, this is a coming of age tale. We weren’t concerned with Gods. In fact, whenever we met Legendary Pokemon, Feraligatr crushed them; and we threw away our Master Ball on a Goldeen. We didn’t need such things. Now consider Eevee – last time labeled as a false prophet and hated – rose to become one of our teams strongest members beneath Feraligatr as the powerful Psychic type Espeon. With the late game additions of Onix and Dratini – who quickly evolved into Steelix and Dragonair – we rounded off our team of challengers. 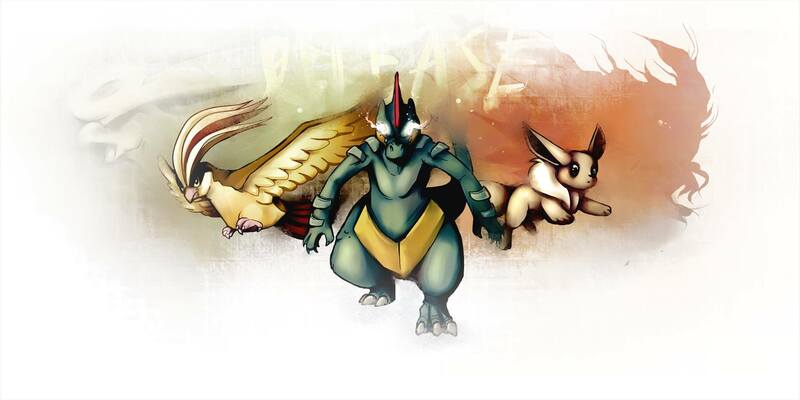 Whether you’re Bird Jesus, False Prophet or neither, all are welcome with Feraligatr. Overall this season has had less participants/viewers than last, but at an average of around 15,000 it’s still doing quite well. All things considered, there was no way Pokemon Crystal could do as well as the original. Pokemon Red was the first one. If you never played another Pokemon game in your life, you probably played Pokemon Red – or its exact counterpart Pokemon Blue. Pokemon Crsytal was a second generation – and it wasn’t even the most popular of that group. Personally second generation was my favorite, but even I didn’t pick up Pokemon Crystal. By and large it was the same game as Gold and Silver aside from a few changes. So there was no way Twitch Plays Pokemon Crystal could match the success of the original. Sure both rely on people coming for nostalgic effect, but no other Pokemon game has/will ever hold as powerful a nostalgic effect as the original Red and Blue versions. And so Red – the protagonist of Pokemon Red – passes his legacy onto Gold – the male protagonist of Pokemon Crystal. Even though we’ve already defeated the Elite Four, the game’s not over yet. Now we must travel back to the land of Kanto – from the original Pokemon Red – and defeat the 8 gym leaders before finally facing off against the Pokemon Master – Red. This sense of continuity is unlike anything we have seen in Pokemon since and makes it the perfect follow up for Twitch Plays Pokemon. 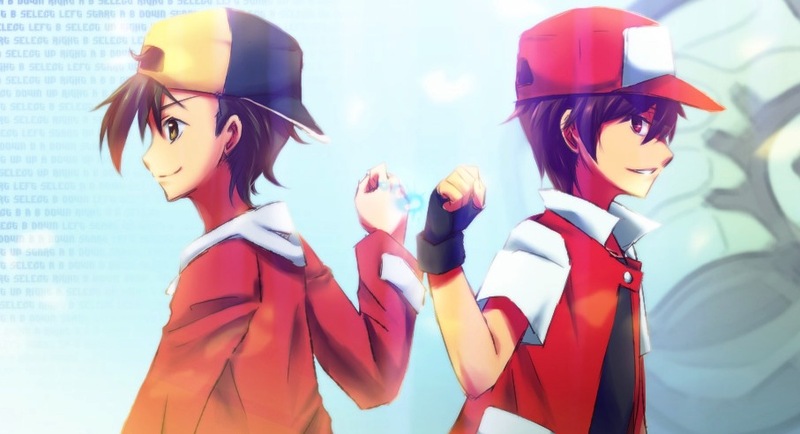 Personally, I would love it if there was a way to make Red’s team the same as the one we used in Twitch Plays Pokemon Red. Either way, there’s more of this season to come and I can’t wait. Despite the larger game format and almost insane amount of trolls, we’ve moved really fast through this game. It just goes to show that no matter the obstacles, the true fans have a sense of drive and determination that nothing can overcome. At the end of the day, that is what Twitch Plays Pokemon is all about. It’s about the creativity! It’s about the fans looking at the almost random events in each play through and developing a cohesive story that touches something inside us. Speaking of the fans, I will once again close with some of my favorite fan art submissions for Twitch Plays Pokemon Crystal. All credit goes to the original artists and Praise The Helix Fossil Fan Page. This amazing artwork compares Feraligatr and Togepi to Roy Mustang and Maes Hughes from the anime Full Metal Alchemist: Brotherhood, who were war buddies that were supposed to make it to the top together to fix the world … until tragedy took one away too soon. As the PC attacks Feraligatr, Togepi tries to protect his friend and gets taken in his place. Introducing Duke Smoochum! He might not have been a part of the team long, but he inspired some of his own fan art as well. Another sad loss was that of our faithful Sentret who was known as The Admiral. Introducing the Jhoto Campions! Seriously, the fan art just gets better and better! Our Noctowl was named Dr Hoot. Why? Because Pokemon are cool!